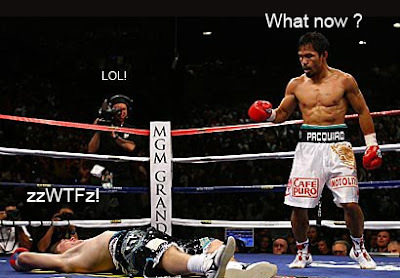 Iphone Dev Pinoy: Manny Pacquiao KO's Ricky Hatton in the 2nd Round! Manny Pacquiao KO's Ricky Hatton in the 2nd Round! Manny Pacquiao knocked out Ricky Hatton with a left hook in the second round of their bout to grab the the IBO light welterweight bout at the MGM Grand in Las Vegas, Nevada, on Saturday (Sunday in Manila). In the very first round Pacquiao sent the Brit down twice with stinging hooks, first with a left and then with a right.